Every now and then a revolution comes about that changes the way something works. It might only be a minor tweak to an existing solution, or the improvement might come in the quality and accessibility that is provided. ‘Teeth In One Day” dental Implants are a revolution in cosmetic dentistry. They allow you to walk away with a new set of high quality replacement teeth in just 1 day. More traditional dental implants require large numbers of screws, as many as one per tooth, to support a new set of teeth. ‘Teeth In One Day” implants are a breakthrough that allows for the minimum number of implants for the maximum number of teeth. As the name suggests, the process requires just four implants to support a full arch of either upper or lower teeth; the new teeth are fixed non-removable replacements that will last a lifetime. 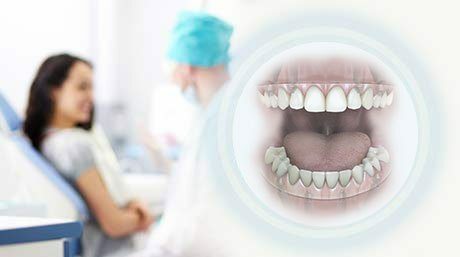 Teeth In 1 Day dental implant treatment can restore the quality of life for those who are suffering from edentulous (loss of teeth), near or partial edentulous. The procedure can be used to replace some or all of a person’s teeth, and is much more time and cost effective than other forms of dental implant procedures, while often offering a higher level of satisfaction and a better quality of life; both functionally and aesthetically. To understand more about what Teeth In One Day implants are, we can take a look at how they came about. In the 1950s, osseointegration was discovered; the process whereby bone cells happen to glue themselves to the surface of titanium. This made implants quickly become an acceptable form of dental treatment for replacing missing teeth, as the implants could fuse effectively to the bone, allowing for structure and functionality as well as the aesthetics. However, there were still problems with dental implants even as the technology and procedures improved. A lot of patients lack deep bone tissue in the area where implants needed to be fixed, and therefore had to undergo extensive and expensive bone grafting surgery before the implant could be set. The other problem was that a large number of implants had to be placed in order to hold a full arch of teeth, which proved costly and invasive for the patient. Even recently this number has always been at least 6 implants, and usually it takes months for the implants to heal in order for a bridge to be fitted. The Teeth In One Day dental implants were an idea that came about through the ingenuity of prosthodontist Dr Paulo Malo in studies by company Nobel Biocare in the 1990s, which made it possible for a full arch of teeth (top or bottom) to be fixed with just four implants, and for patients to walk away in a day with a new set of teeth. How Do ‘Teeth In One Day’ Dental Implants Work? 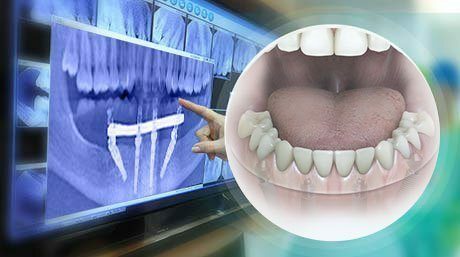 By now you might be wondering how this mighty discovery was possible, and what ingenuity could possibly make dental implants so sophisticated in such a leap. The ‘Teeth In One Day’ Implants consist of two screw implants fitted to the front of the jaw at a 90 degree angle (the same angle as a standard procedure), and two fitted at the back of your jaw at a 45 degree angle to your jaw. The implants are placed in the anterior maxilla, an area of the jaw where bone density is higher, negating the need for bone grafting. A bridge is then attached to the implants, and because of the angles this locks them into place, and allows for much more effective healing, and will increase the likelihood of long term success. 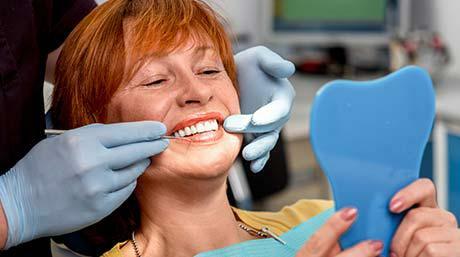 What Does A ‘Teeth In One Day’ Dental Implant Procedure Involve? The ‘Same Day Dental Implants‘ Dental Implant procedure has come to be known as “Teeth In One Day” but is that really the case? Well, in a way yes, but first your prosthodontist will need to see you for an initial appointment, in which they will assess your case, evaluate your mouth, and discuss some details with you. You may need a diagnostic such as a CAT scan. When it comes time for the actual procedure, the Teeth In One Day does indeed take only a day of surgery. You will have any teeth extracted that need to be in order to fit your new arch. 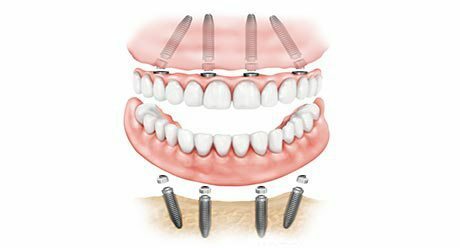 Then four implants will be tactfully placed in your jaw, as described above, in a way that achieves optimal contact and anchorage. Next, the abutments are fitted, which connect the implants to your replacement teeth and are then fastened on. Your prosthodontist will have had these replacement teeth specially made to fit your mouth. You will then check over the implants and will be free to leave the dental surgery with your new set of teeth. A follow up appointment is likely to occur within six months just to check if the teeth have properly set and possibly to replace the set with a new permanent set. Being at the dentist is rarely pleasant. We try to make it as nice as we can, but we understand you want to be in and out as fast as possible, and are much more concerned with the quality of the results than the experience of being in the chair. All-On-4 offer a much shorter procedure time, and need only one day of surgery to give you a new set of teeth. The fact that you require less procedural time, and the fact that less implants are needed compared to the number of teeth that you are replacing, means that the costs are lower compared to standard implant treatment of the same number of teeth. The Teeth In One Day implants are attached to your anterior maxilla, which allows for more structure and more contact with bone cells for osseointegration. Longer implants can also be used because of the angles of the implants. We provide dental implant solutions, and their products guarantee that only the finest scientifically researched implants and procedures are used. They allow for optimal handling and the best aesthetics for your teeth. It is possible to get Teeth In One Day dental implants by consulting your dentist or prosthodontist. If you are suffering from tooth loss and want permanent replacement teeth to bring back your smile as well as your bite then Teeth In One Day are the best implants available on the market. Friedman Dental Group are experienced and fully qualified prosthodontists who provide the latest Teeth In One Day dental implant treatments. Contact us today to find out more or to book an appointment.